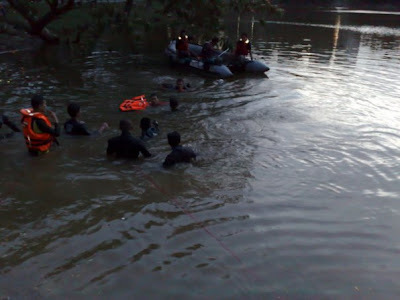 Rescuers searching for the bodies. Divers underwater. I was on the way to pasar ramadhan when the call came. "Lapor diri di bilik gerakan (BG). kes lemas. 3 mangsa kanak2. pandan". So I immediately made a U turn and headed home to change and pick up my diving gear. Upon arriving at BG, the boys were waiting. The first team was already on site and delivering more info through the radio. "Mandi tasik"...hmmm, that makes the task easier, I thought to myself. With strobe lights flashing and sirens blaring, we made our way through the traffic jam. When we arrived, we met up with the first team and teamed up with members of Fire Services & Rescue. All of us were determined to retrieve the bodies before dark. There was a huge crowd of onlookers. Amidst all these, a group of women sat huddled together, crying in silence. "Itu emak2 mangsa dan keluarga, staf" I was informed. At around 6.35pm, the first victim was found. At 7pm, the second followed by the last one 5 minutes later. Upon seeing the bodies of their sons, the mothers wept uncontrollably. This is the point where everyone, including the rescuers, shed a tear. Of course being in uniform and all, we had to swallow our sadness. After a short while, the call of azan could be heard, adding to the already emotionally draining scene. After packing up our equipments, we headed back to BG. One 'makcik' was kind enough to give us dates to break fast with. By the time we completed cleaning and storing back the equipments, it was already 9.15pm. At 9.30pm, we finally had our 'buka puasa' meal. Coming home, after taking shower and saying my prayers, visions of those boys were stuck in my mind. I had come across much, much worst scenes, even mutilated bodies, but somehow, when it comes to kids, esp 3 young kids, laid in a row, side by side, friends till the end (2 of them drowned while trying to save the other), was harder to forget. I had broken the golden rule of a rescuer...no emotional attachment to the victims.